The Light the Night Walk is organized every year in numerous cities across North America to honour those who have been affected by cancer. Families and friends from all regions of Quebec gathered Saturday, Oct. 13 in Parc Jean-Drapeau on Île Notre-Dame, to walk in remembrance of those who have been lost to cancer. Light the Night is hosted by the Leukemia and Lymphoma Society of Canada (LLS), a charitable foundation whose main mission is to cure blood cancer. The march helps fundraise for the foundation, as well as other research and support programs for patients. “What’s great about this event is that it allows people to connect with others,” said Gilmore. “Often, when we deal with loss, grief or the stress and the heartache that comes with the disease, we feel isolated and forget that other individuals are potentially experiencing a similar situation,” she explained. “What’s great about this event is that it allows people to connect with others,” said Montreal-based singer Vikki Gilmore. Photo by Mackenzie Lad. A crowd of more than 5,000 people gathered in the park before the march, which took place from 7 p.m. to 9 p.m. There was almost no industrial light throughout the event. The only light cutting through the darkness came from the colourful lanterns waving in the air. From beginning to end, the march was full of cheerful volunteers, and smooth music set the ambiance for the walk. Volunteers gently shushed the crowd to have a moment of silence for family members and friends who lost someone to cancer. On each side of the trail, there were small transparent bags with artificial candles in each one. Written on the bags were the names of those who have fought against blood cancer. “It’s hard when you lose a loved one,” said a mother, who wished to remain anonymous, whose daughter passed away from leukemia at the age of four. “To have the family and friends here supporting you and your loss is such a beautiful gesture,” she added. At the end of the march, volunteers congratulated the participants. “There is so much that can be done,” said Gilmore. 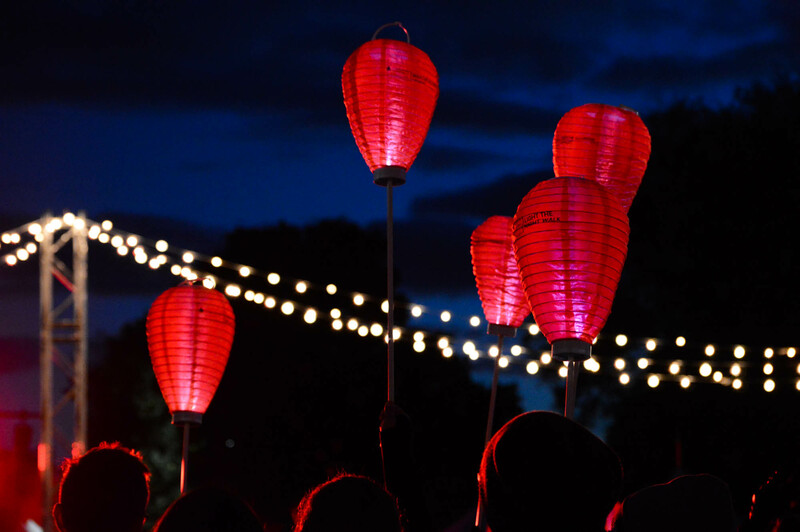 “With foundations like the LLS Canada and fundraising events like Light the Night, so much more can be done.” The annual event creates a community of supporters, survivors, researches, and patients who, for one night, bring light to something typically so dark. Feature image by Mackenzie Lad.